The Duesenberg Model J was introduced in 1929, and the car you see here is a very early example, carrying engine number J-118, or the 18th example built. But this is not how a normal 1929 Duesenberg would have looked. Originally bodied as a Derham Sedan, this car was the first Duesenberg bodied by that firm. Sometime in the 1930s, the car ended up in the Santa Barbra Channel and was then sold to a new owner. As some of the car was ruined, he sent it to Bohman and Schwartz to update the bodywork and interior. So it now carries a mid-30s streamlined design. The 265 horsepower, 6.9-liter straight-eight is original, however. Part of the Blackhawk Collection in the mid-1990s when it was last repainted and freshened, this car has been the same collection for the better part of a decade and should bring between $750,000-$950,000 at auction. Click here for more info and here for more from this sale. This black Model J is one of five such units produced by the Derham Body Company of Philadelphia. 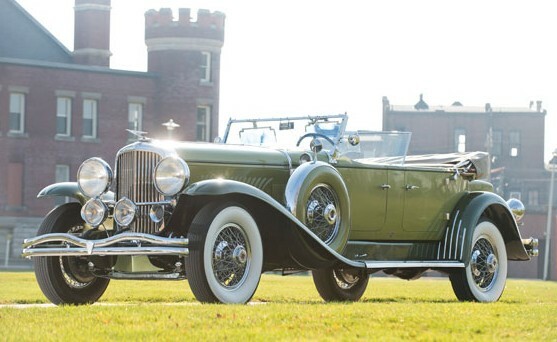 Derham traced their roots back to Joseph Derham’s 1887 carriage factory and later produced bodies for the likes of Stutz, Pierce-Arrow, Cadillac, Duesenberg, and more. 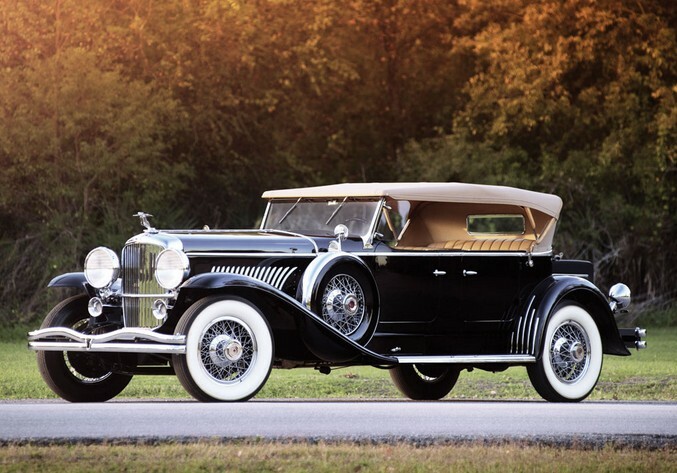 This is a Duesenberg Model J – one of the greatest cars ever built. This particular car is supercharged, and thus is a retroactive “Model SJ.” But the supercharger isn’t original. When supercharged, the 6.9-liter straight-eight makes 320 horsepower. 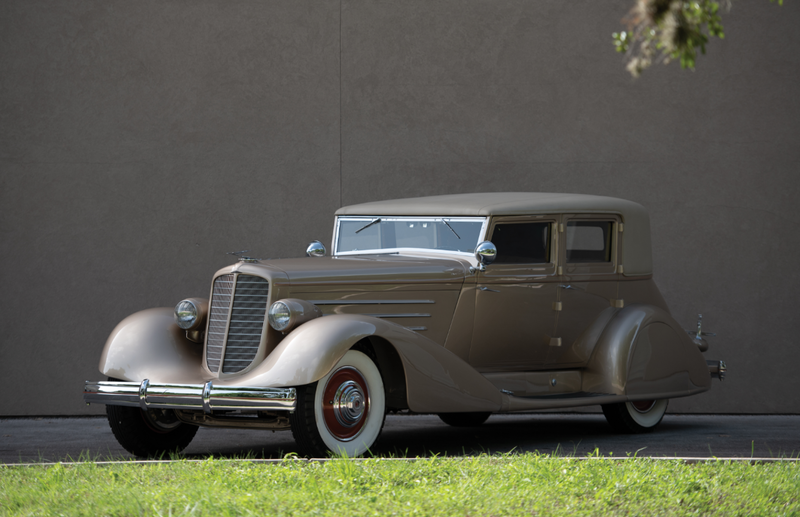 This car began life as a factory demonstrator and was later owned by Jean Harlow’s 1930s husband as well as Buster Keaton’s son, James Talmadge. At some point early in this car’s life, parts of the engine were exchanged with the factory-supercharged J-208. When the current owner acquired the car in 1977, he set about making it whole again. He located J-208 and swapped the parts back, making both cars better for it. He later sourced a supercharger, taking J-488 back to how it would’ve been set up in the late-1930s. And now here it is, wonderfully restored and correct – on sale for the first time in 41 years. It should bring between $1,750,000-$2,000,000. Click here for more info and here for more from this sale. The Derham Tourster is one of a few body styles of the Model J Duesenberg that are highly sought after (as if there is a Duesenberg that isn’t). Only eight were built originally and over the past few years, two others have come up for auction (with a further two that sported recreated Tourster bodies also coming up for sale). The great thing about the Tourster is that its second windshield actually rolls up and down instead of flipping up and out of the way like most Dual Cowl Phaetons. Derham, of Rosemont, Pennsylvania, was the sole constructor of this beautiful body. The engine underneath is the standard Model J 6.9-liter straight-eight making 265 horsepower. This car was sold new to Chicago, where it remained with a variety of owners until departing the city in 1948. It has had even more owners since, with the current owner residing overseas. The restoration is older but it shows well and the color combination is brilliant. The average price for the last two Toursters to have sold is about a million dollars, so look for a similar amount here. Click here for more info and here for more from this sale. At first glance, this car screams “owned by the head of a movie studio but never actually driven by that person.” Taking a step back and thinking about the larger story of the time, we see that America had just been attacked and that this was one of the final new cars built by Detroit prior to the war. In fact, this car is one of just two Derham-bodied Town Cars on Cadillac’s Series 60 Special chassis for 1942. The engine is a 150 horsepower 5.7-liter V-8. The car started life as a Series 60 Special Imperial Sedan (which was a mid-range Caddy for ’42) and then it was shipped to Derham in Pennsylvania to be converted to this chauffeur’s machine you see here. It was delivered new to someone in New York and the present owner acquired it in 1974 and restored it. 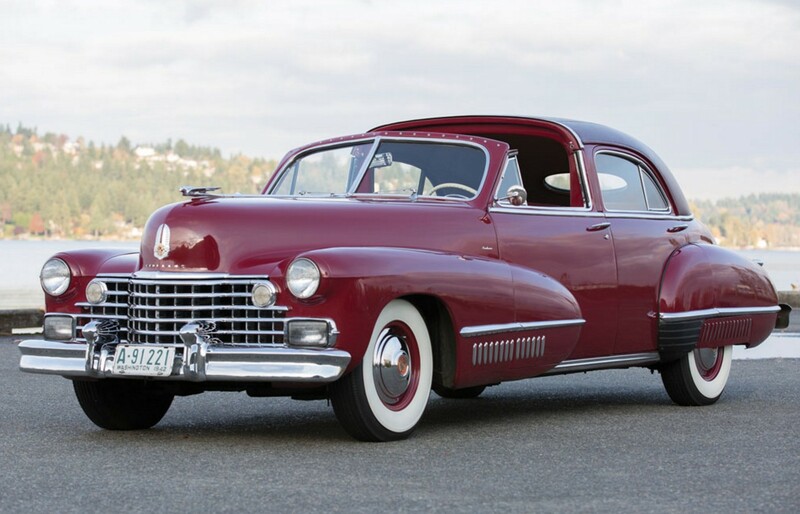 It’s a fairly unique machine in that most Cadillacs were bodied in-house by this point – and most Post-War Cadillacs were too, making this the last of its kind. Click here for more info and here for more from this sale. 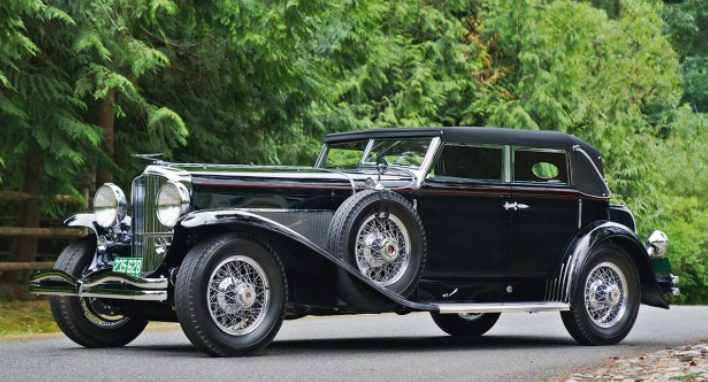 This is the second Derham Tourster (of the eight originally built) to be offered at an RM auction in 2013. The other one, J-423, sold for $1.32 million. That one had kind of an interesting history, being owned by an Italian Count and all. This one is slightly more interesting. J-444 was delivered new to film comedian Joe E. Brown, who was known for his comedic roles in the 1930s-1950s (and he was the rich gentleman who hilariously courted Jack Lemmon (in drag) in the near-perfect film Some Like It Hot. He delivered the classic line “Well, nobody’s perfect”). By the time World War II came around, the car was passed around before it came into the hands of a Mr. Howard Hughes. 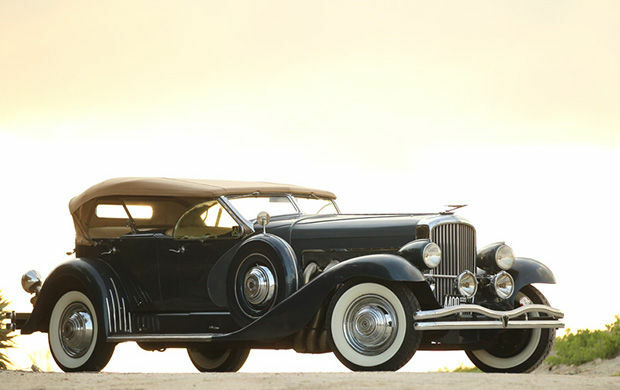 Hughes liked powerful things and the Duesenberg Model J fit that bill. A 265 horsepower straight-eight engine was about as good as you were going to do in the day. He, apparently, wasn’t so concerned with the gorgeous Derham Tourster body on the car – as he cut the rear half of the car off and used the car to tow gliders up and down a runway – aircraft, after all, were his business. The car was later in the Otis Chandler collection and then the John McMullen collection and a replica of its original body was fitted at some point. This is a real Derham Tourster, but it just doesn’t have the original Derham Tourster body it came with. It is remarkable to look at nonetheless. John O’Quinn acquired it after that. This car has been in the hands of some seriously famous people and well-respected car collectors who obviously didn’t let its “replica” body scare them (as it shouldn’t). This car sold in 2007 for $1.35 million. It won’t bring less than that this time around but that is, apparently, the going rate for a Derham Tourster today. Click here for more info and here for more from RM at Amelia Island. It’s been a little while since we’ve featured a Model J. But luckily, the sales in Arizona are upon us and these sales are one of three or four places annually awash in high dollar cars like this. It’s a normal Model J with the big straight-eight engine making 265 horsepower. The car wears a “Tourster” body from Derham – making it one of only eight Derham Toursters. Also cool is the fact that this is the original engine and chassis combination – a feat of which many Duesenberg’s cannot boast. Derham was founded in 1887 in Rosemont, Pennsylvania as a carriage builder. Like many, they made the jump to automobiles, becoming the longest-lasting coachbuilder in America – the only “classic-era” company to make it through the Depression. This car was, for a time, owned by an Italian Count and located in Italy. It has since, obviously, come back to the United States where it will sell for somewhere around $1 million (give or take a few $100,000). For more information, click here. For more from RM in Arizona, click here. Ordinarily I wouldn’t feature a car on a Saturday, the day I normally reserve for auction results or, well, my day off. But this is a makeup post because two weeks ago I featured J-355, a car which had already been featured. I knew this car was for sale, and it was going to be skipped so I could feature that other car. So I felt dumb, and here we are. This is a Model J that was constructed from pieces of other Duesenbergs. In total, three cars combined to make this one. A Willoughby Sedan originally sat atop this chassis and the engine came from a Murphy Convertible Sedan. Other parts came from a car that was once a Rollston Cabriolet. But it does have an actual Duesenberg engine, no. J-356. The body is not original. It is one of a few built by a man named Ted Billings to an exacting standard in the style of a Derham Tourster. 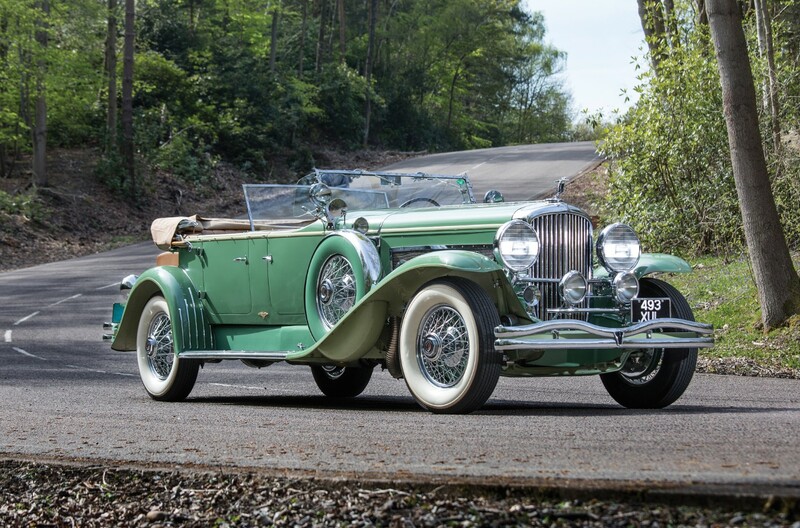 This type of Model J isn’t the most desirable, but it will get you in the ever-exclusive “I-own-a-real-Duesenberg” club. The cost of entry? $799,900. For more information, click here. Update: Failed to sell at Motostalgia, Houston 2014. Update II: Failed to sell at Bonhams, Greenwich 2015. 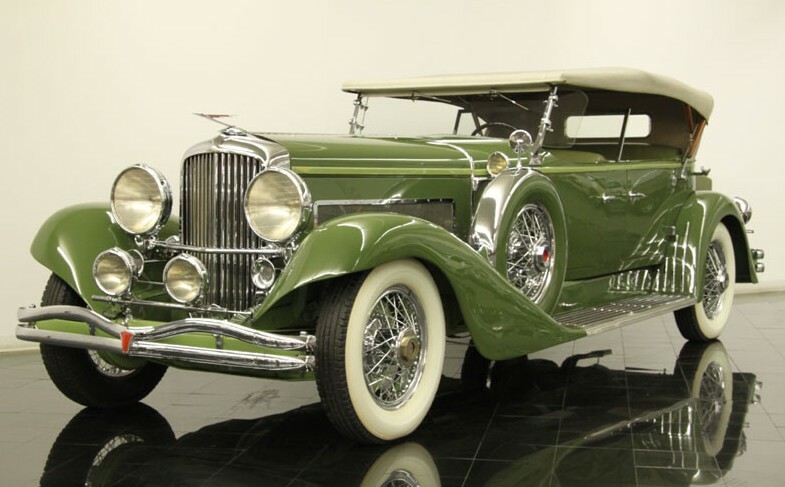 Okay, one more Model J to close out Duesenberg Week. This one is still available for you to purchase, coming up for sale at Auctions America’s Auburn Fall Sale here in a few days. This car has a somewhat convoluted history and is, like many Duesenbergs, a combination, of sorts, of two separate cars. The body, the Derham Sedan style you see here was originally attached to J-551. The owner didn’t like the new aerodynamic design updates and waterfall grille and had Duesenberg reinstall the 1929-style grille and trim bits to the car. Sometime later, the body was removed and the engine and chassis of J-551 were used for another project. The owner of J-310 used the original body from his car (a Judkins Limousine) for a separate project as well. Well, the remnants of both J-551 and J-310 ended up in the hands of the same owner, Homer Fitterling, who mounted the Derham body you see here on J-310. So two leftovers were combined to build this car. 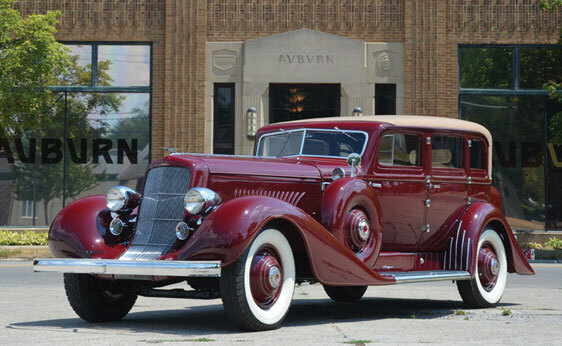 When Fitterling reassembled it, he added the updated Duesenberg parts to the Derham body that the original owner did not care for. This car was owned by a number of people during the 1980s and 90s and has spent the last 10 years or so in a museum, being driven on a limited basis. It is ready to be used and you will not find another one like this as the body, with the factory updates, is one-of-a-kind. Auctions America hasn’t published an estimate, but expect it to sell for north of $500,000. 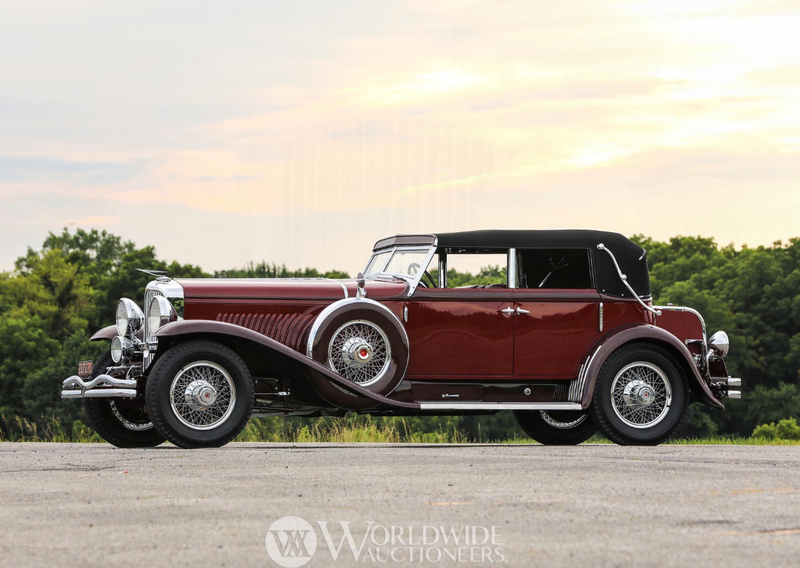 The complete catalog description can be found here and click here for more from Auctions America’s Fall Auburn sale. This Model J has the LeBaron Dual Cowl body on it – my favorite bodystyle. This body was originally attached to a different chassis and engine than it is now. When it was first bought, it was wrecked and the chassis was junk. So Duesenberg removed the body, repaired it, and fitted it to a new chassis and engine, the one it currently has, including engine J-270. One reason this car doesn’t really look like all the other LeBaron Dual Cowl Phaetons is because in 1937, the then-owner took the car to Derham and had them streamline it a little. There are aspects of this car that scream “1930s Art Deco” instead of “Big 1920s Touring Car.” The skirted fenders and bullet headlights are an awesome additions. This car has been with the current owner for almost 60 years. It has been used regularly and never restored, just mechanically maintained. The two tone blue paint on the Sweep-Panel body (which is hard to see in the photo above) has helped create the nickname “Blue J” for this car. For being unrestored, this is a truly impressive automobile. The pre-sale estimate was $2,000,000-$2,750,000. The complete catalog description is here.